You are currently browsing articles tagged Meegan Voss. The Antoinettes were the reigning girl group during the Scorgies era, playing out numerous times before venturing into the wilds of New York City to seek fame & fortune. The band was fronted by keyboardist Meegan Voss, whose Syracuse band the Poptarts made some noise in the CNY music scene. 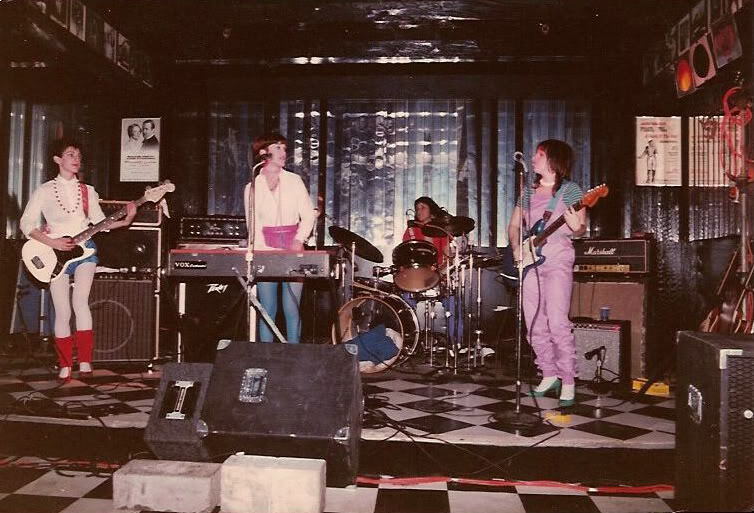 Meegan moved to Rochester with Margie Shears to start the Antoinettes and they were soon joined by Eastman School of Music student Kim Milai on drums and Poptarts veteran Cathy Kensington (aka Cathy VanPatten) on guitar. So, where are they now? Megan continues to make music with her husband Steve Jordan as the Verbs; Kim teaches at an elementary school and has a side career doing children’s music. Cathy Kensington works as an editor and lives in the Chicago area. Margie Shears, according to Cathy’s blog, lives in the Westchester NY area and works as a graphic designer. 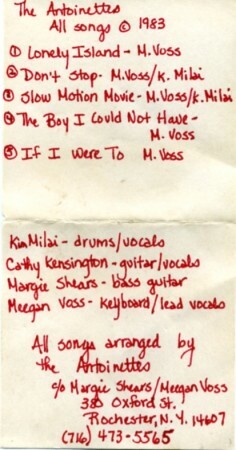 According to Cathy, “after we did that demo, I left the band to follow my (then) boyfriend to Boston. The Antoinettes then added a guitarist (Sue Veneer) to replace me and a keyboard player (Magda– I don’t remember her last name) to take over that role so Meegan could devote her efforts to fronting the band. That was the band that ended up going to NYC and becoming the darlings of CBGB’s.” I’ve picked one of the best songs recorded in that demo session, “If I Were To, ” a plaintive lament that captures a contemplative Antoinettes pining for a boy they could not have. Click on the link below to play the song in a new window, right-click or control click to download the file. Hey does anyone remember Del Roy Rebop? Or the all girl band the Antoinette’s? The Lead singer of the Antoinette’s- Meegan Voss has a band called the Verbs now. I believe they are based out of NYC. I remember seeing both of those bands more than a few times at Scorgies. Also a Canadian band out of Hamilton- shoot I can’t remember their name- but they had a great song called “I’m Surfing On Heroin”. I think I actually have it on my IPod….Just can’t seem to remember their name right now…Must have been all the drugs…But I know I saw them at Scorgies as well! Great memories of those days at Scorgies. I only spent 3 years at Scorgies- early to mid 80’s, but it was every night for sure and I wonder how I did it…That time was probably the most significant time in my life that molded and shaped so much of how I look at the music world today…Great Memories! Thanks!